So far, we have learned how to create a 1-way frequency table that focuses on a single categorical variable. The n-way crosstabulation table offers insights about the relationship between multiple categorical variables. The CS data set contains a list of customer service rating along with the customers' gender. There are 4 rating options (A, B, C and D). Let's take a look at the frequency distribution of the customer service rating alone. ​The rating looks decent. More than 50% of the rating is either A or B. 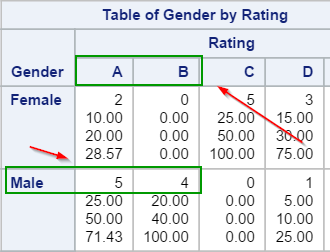 Now, let's take a look at the result of a 2-way crosstabulation table with Gender and Rating. To create the 2-way crosstabulation table, you must add the two variables to the TABLE statement separated by an asterisk. 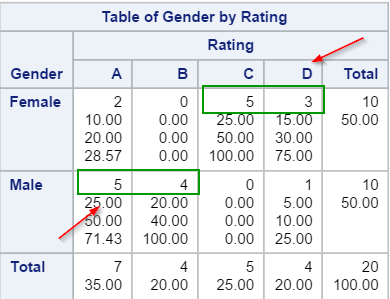 The 2-way table shows the rating statistics across both genders. The female customers responded with mostly negative rating, with 5 rated the service a C's and 3 rated a D's. 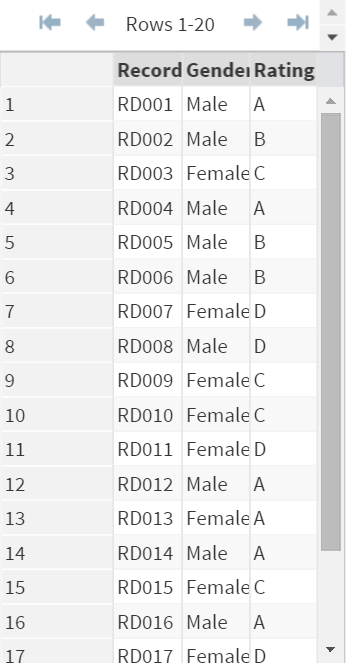 This is clearly in contrast with the male's rating, where 5 rated a A's and 4 rated a B's. By looking at the 2-way crosstabulation table, the company might want to invest resources in providing better services to their female customers. The TRTMT data set contains the treatment information from a depression study. Create a 2-way crosstabulation table across Trt and Days. Briefly describe whether the treatment is more effective than the placebo.